Found and constructed objects. Charms for making, to keep the connection between hand and heart, to inspire a light touch and unburdened memory, a simultaneously focused and detached response to a wild flow of ideas and an overwhelming abundance of materials. Finishing a work of art is all about letting go. 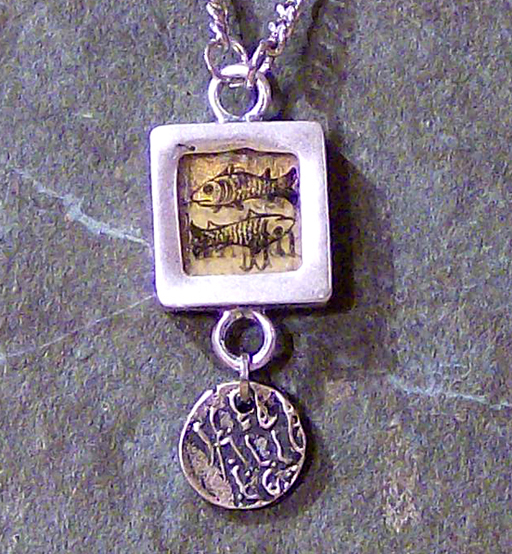 Patin’d silver metal bezel and chain and vintage charm. The image is a hand painted paper tile is an original work of art comprised of vintage paper, ink, and oil paint glaze to resemble the palimpsest of illuminated manuscripts. The fiery flowers of pineapple sage, young radishes in a driftwood bed, one last rose before winter, and the sun shed at sunset. Chimerical Charms and Alchemical Amulets. It seems that amulets and talismans are in the ethers lately, which makes perfect sense. It’s the times. These times are strange aren’t they? 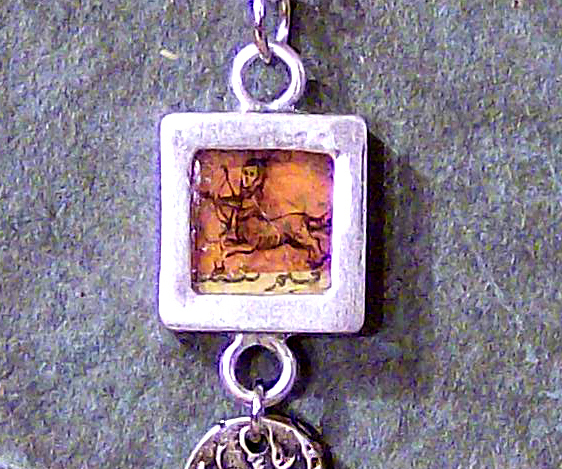 This is my experiment in jewelry making with tiny versions of my paintings as the jewel. They are one half inch to one inch square original works (not prints) that I have made into charms and pendants. This ouroboros intrigues me. I admire the mischievous look in his eye. 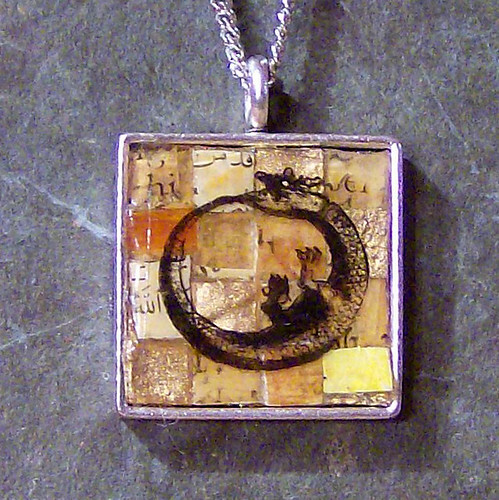 The others are under 8mm teeny tiny mixed media paintings set in sterling silver bezels. This was fun to do. This is another experiment with working dry. I “painted” the surface with composted endpapers by ripping it strategically and hand-stitching it to linen. Then I drew on the paper (ink, pastel, crayon, pencil) and embellished it with embroidery.